Bere Island taking part in football matches. 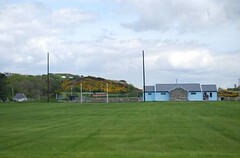 In fact Bere Island is unique in that it played an International match on it’s home pitch with the English Military Team in 1911 at the Lawrence Cove Recreation Ground. Bere island first entered a team in the Beara championship in 1927. They won this competition in 1930, 1939, 1941, 1942, 1943, 1981 and 1985. They played in the county senior championships in 1944 and reached the county final in 1945. In the 1960’s early 70’s and again in the late 80’s, due to dwindling numbers and emigration, the club disbanded. 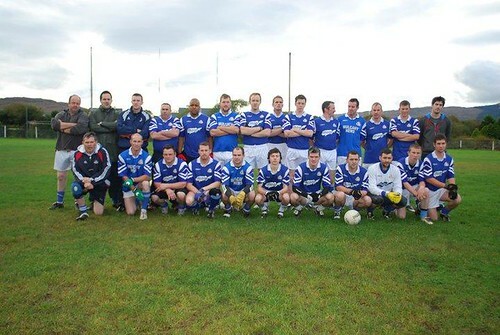 In 1995 the club reformed and from 1996 to present day compete in the Beara Junior B competition. We won this competition in 1996 and also 2008. We also compete in the All Ireland Islands Tournament which the lads won in 2005 and we were the host Island this year September 2010 with the Island Women’s Team winning the overall competition. We are very proud of this achievement and to have hosted so many island teams on our new pitch and dressing rooms. We are a club that look forward with hope and optimism that our new pitch will nurture many stars of the future that will wear the Bere Island jersey with pride and passion as did their fore-fathers and indeed their fore-mothers did before them.